You are currently browsing the tag archive for the ‘competitiveness’ tag. Philadelphia was selected today to join an economic development network created by the Global Cities Initiative (GCI) , a five-year joint project of the Brookings Institution and JPMorgan Chase. Philadelphia’s application to, and participation in, the Global Cities Initiative is being co-led by the Economy League of Greater Philadelphia and the World Trade Center of Greater Philadelphia. Launched in 2012, the Global Cities Initiative helps business and civic leaders grow their metropolitan economies by strengthening international connections and competitiveness. GCI activities include producing data and research to guide decisions, fostering practice and policy innovations, and facilitating a peer learning network. This network, the Global Cities Initiative’s Exchange, assists metropolitan areas as they develop plans to achieve sustainable growth through increased exports and foreign direct investment. Philadelphia is one of eight metro areas accepted to the GCI Exchange’s 2015 group, the final cohort of the full 28-metro-area network. The Brookings Institution selected metro areas for the Exchange through a competitive process based on their readiness and commitment to pursue the Exchange’s global competitiveness principles. In addition to Philadelphia, the other 7 members of the new and final cohort include Baltimore; Fresno, Calif.; Houston; Kansas City, Mo. ; Salt Lake City; Seattle; and St. Louis. The 2015 cohort joins participating municipal regions selected during the three previous years – 4 in 2012; 8 in 2013; and 8 in 2014. Those previous participating municipal regions include: Atlanta; Charleston, S.C.; Chicago; Columbus, Ohio; Des Moines, Iowa;Indianapolis; Jacksonville, Fla.; Los Angeles; Louisville-Lexington, Ky.; Minneapolis-Saint Paul; Milwaukee;Phoenix; Portland, Ore.; Sacramento, Calif.; San Antonio; San Diego; Syracuse, N.Y.; Tampa Bay, Fla.; Upstate S.C. representing the Greenville-Spartanburg-Anderson CSA; and Wichita, Kansas. I have some major catching up to do so let me begin here with a link to my book which the Wilson Center launched on September 24, 2012. (Note: if you want to download the PDF of the book, just right-click and use the Save As option). More 2012/3 updates to follow in rapid sequence. U.S. 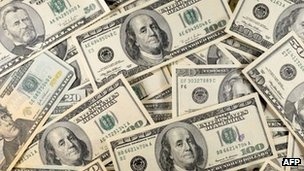 Regains Pace-setter Position for Global Clean Energy Investment. What Does It Mean? This is the second in the 2012 series of Cooketop News commentaries and news recaps. By reviewing the previous week’s top stories involving — broadly speaking — U.S./China clean energy, the commentary section isolates one trend/dynamic which points forward and can help illuminate news-in-the-making for the week(s) ahead. Following the commentary is a summary of the week’s top stories. This week? We look at the headline (Cooketop News, Friday, January 13th) that, after four years, the U.S. re-took the lead from China as the front-runner in global clean energy investment. From 2008-10, the U.S. visibly lost pace – and, in some instances, lead position – to China as the world’s top investor in clean energy. In 2010, China – then just over one-third the size of the U.S. economy – invested twice the absolute amount in clean energy as the U.S. Yet, in 2011, the U.S. bounced back, reclaiming top-spot for the first time in four years: U.S. investment increased 33% to US$56 billion while Chinese investment remained flat at $47 billion, according to Bloomberg New Energy Finance. What does it mean? Less than the headlines might suggest. (1) It’s not a sprint, it’s a marathon. The bragging-rights prize will ultimately go to the economy which manages the best combination of technological innovation, political support, and financial sustainability over many years. Germany and Spain have seen political support for their heavily subsidized systems erode with the euro. The U.S. is in near political grid-lock over how to set that balance. China’s position looks strong on the surface but is hobbled by lack of technology innovation, political accountability and financial transparency. (2) How high’s the bounce? The U.S. resurgence is due to short-term programs due to expire soon, such as biofuel support programs and energy efficiency measures. Absent a broad national consensus, there is no strong reason to expect the U.S. “bounce” to remain strong throughout 2012, an election year. (3) The bottom-line is this is a race is against time, not a Sputnik-type competition. For either nation’s efforts to pay off, investment will need to be scaled to a global level by investors, public and private. That won’t happen unless there is a clear middle-way between the extremes which tend to bedevil U.S.-China relations – zero-sum, highly-nationalistic competition on the one hand vs. unrealistic and unsustainable ideas of cooperation on the other. While the metric of renewed investment vigor in the U.S. is encouraging, the real challenge for the future will be to define and align complementary ‘skill-sets’ in both the U.S. and China so that capital can be attracted and deployed on a global scale through these two massive markets accounting for 40% of the global GHG emissions problem. We’ll need a discerning eye for the different strengths which our two countries can bring as complementary partners in this effort as well as a realistic understanding of our enduringly different systems and values. Regardless of who has the momentary lead in investment level, we need to recognize that there is no path to a sustainable future for either country without clear-eyed, realistically-based and sustained cooperation between the two. Does the U.S. Prefer a Ma Victory in Taiwan? In the spirit of sharing news while it’s fresh, I’m copying verbatim a report on the gold nugget in the pile of dross that has passed for this year’s national budget process. For those of you who took in (in person or digitally) the Philadelphia’s 21st Century Energy Opportunity event I convened with the Academy of Natural Sciences and the T.C. Chan Center for Building Simulation & Energy Studies on October 11th, the win is obvious — for the City and the region, for the national effort for cleaner energy jobs and investment, and for our global engagement. For U.S./China clean energy cooperation, this budget victory also solidifies the framework of U.S./China Clean Energy Research Centers CERC) in building energy efficiency (Lawrence Berkeley Lab), electric vehicles (University of Michigan) and clean coal (University of West Virginia). Kudos to Mark Muro and Bruce Katz for their success in keeping this ball moving down the field. Here’s the report from late yesterday afternoon. Notwithstanding the bleak outlook surrounding federal clean energy policy detailed in our recent report “Sizing the Clean Economy,” the FY 2012 omnibus spending compromise hammered out last week actually contains several reassuring affirmations of the value of recent institutional experiments. One winner is the Advanced Research Projects Agency-Energy, perhaps the Department of Energy’s most popular program. Although the program is funded at just $275 million–about half the level President Obama had requested–many will probably be relieved that the program has now survived, which hasn’t always seemed a certainty. Moreover, the deal improved on earlier bills that have circulated, suggesting that the cause of the government fomenting disruptive innovation using “outside-the-box” investments in venturesome technology ideas may be gaining traction. That’s good news. So is another happy surprise in the deal: the authorization of two new DOE Energy Innovation Hubs, one specializing in rare earths and energy-critical materials and one for energy storage technologies. To be sure, the Obama administration had originally asked for eight of these hubs, and settled for three before this year requesting funds for three more in 2012. However, congressional appropriators weren’t convinced that there was a need for a hub focused on smart grid technologies, as reported Darius Dixon in Politico, and so the nation now has two more of them, for a total of five of these special purpose-driven, multidisciplinary centers for accelerated collaboration between corporations, universities, and government labs. Yet we’ll take it. Having long argued that the nation has been making do with an obsolete energy research paradigm excessively oriented toward individual academic investigators, on the one hand, and the siloed and bureaucratic efforts of the DOE’s energy laboratories, on the other, it is gratifying to watch the slow but continuing rollout of a true network of well-funded, multi-sector regional innovation centers. Congress is doing the right thing by creating–hub by hub–a set of sizable new institutes charged with “winning the future” in energy technology. (1) Post-WWII, Asia (and notably China since 1982) has had clear advantages of cheaper land, cheaper labor and cheaper facilities relative to manufacturers in higher per capita income markets in the West. Since solar panel production has some basic similarities to the manufacturing process for computer memory chips (which in the 1990s were the basic ‘rice’ commodity of the IT boom in Asia), solar manufacturing has benefited from the natural ‘cluster effect’ of decades of chip manufacturing know-how of Chinese, Taiwanese and other investors on the mainland. markets like Germany and Spain and state markets in the U.S. such as New Jersey that have been subsidizing the industry (on the consumer side). [Note: World Trade Organization rules tend to allow/encourage consumer-side subsidies and to sanction producer-side subsidies, hence the recent trade action by the 7 Western solar firms against China. However, these actions take time to work their way through the ‘python’ of WTO process). As a wrote almost a year ago ( click here for link ), there’s a global boom/bust going on in PV solar and China is in the thick of it. The Fukushima disaster in March has prompted all major nuclear powers to pause and reexamine their nuclear development programs. Germany and Italy reached decisions to phase out their nuclear programs. In the U.S., stirrings of interest in a nuclear revival were silenced. In China, however, all indications are that a national program to establish China as a global leader in nuclear power remains on track. The first commercial nuclear power plant in the U. S. was installed in 1958. Today, 104 commercial reactors produce almost 20% of the nation’s total electric generation. By comparison, China’s first nuclear plant, Qinshan, near Shanghai, became operational in 1991. Today, 13 plants are in operation supplying just over 1% of China’s total electricity. However, this freeze frame comparison misses the contrast in momentum for the nuclear industry in the two countries. Of the 52 nuclear power plants that were either under construction or in advanced planning in America and China in late 2010, months before the Fukushima disaster, 50 of those plants were being planned and built for the Chinese market. 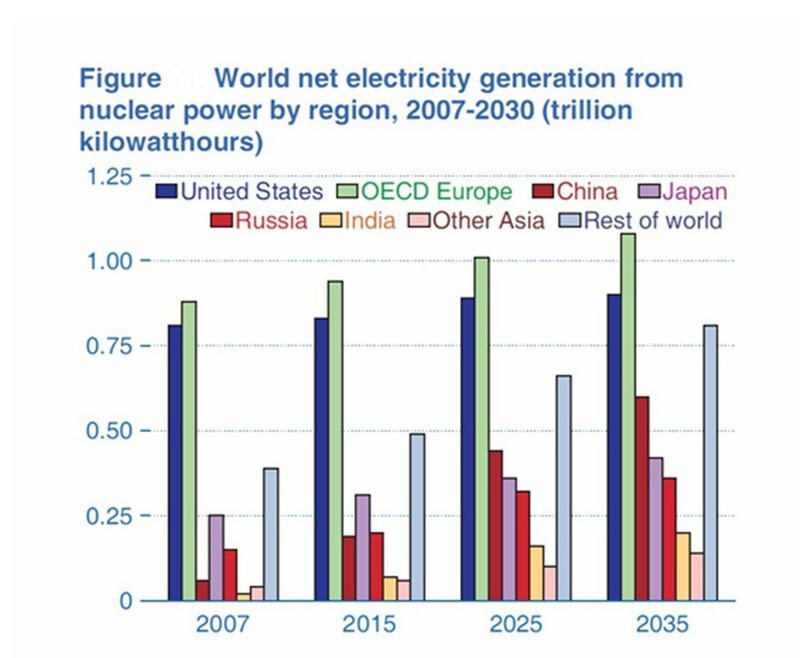 As the above chart from the U.S. Energy Information Administration shows, nuclear generation has plateaued in the U.S. and Europe but is rapidly growing in China, India and the rest of the developing world. While active plants in the U.S. are approaching the end of their licensed lifetime without planned replacement, new nuclear installations in China are set to increase roughly ten-fold over the next ten years. Following 1979’s Three Mile Island incident, the experience for the U.S. nuclear industry has been new order cancellation, new construction abandonment, premature shutdown of plants or extension without plans for replacement. Although improved design and technology advances have brought about significantly improved safety performance, public opposition to nuclear power — periodically galvanized by highly publicized international incidents such as Chernobyl and Fukushima and persistently bedeviled by the nuclear waste disposal problem– has kept the U.S. market virtually off-limits to new nuclear installations for three decades. China, by contrast, is the world’s most active site for new plant installations. National planning calls for nuclear power to provide 6% of China’s total electrical generation by 2020. This will require a net increase in installed capacity of 60-70 GW, comparable to the entire 63GW of currently installed nuclear capacity in France, one of the world’s most active users. By 2030, China plans to match the nuclear output currently provided by all 104 U.S. installations. The bottom line: Chinese authorities clearly know how to throttle back a prestige industrial development project, as shown after July’s high-speed train collision in Zhejiang Province. After the Fukushima nuclear disaster, however, no such bureaucratic braking of China’s nuclear program has been apparent. Additional safety reviews have been instituted, but the scale and speed of China’s nuclear program remains essentially unchanged. (This piece has been reprinted from G+ Insights, a publication series of the Gerson Lehrman Group at www.gplus.com. The G+ piece, in turn, has been adapted from Sustaining U.S.-China Cooperation in Clean Energy, a book publication authored by Terry Cooke forthcoming from the Kissinger Institute of the Woodrow Wilson Institute in November 2011).